Sammy Donnelly has conceded defeat as Bostik League South relegation looms for his Shoreham Football Club side. Basement boys Mussels have been left 14 points adrift of safety with just five games to play following a 3-0 home loss to Guernsey at Middle Road last night. Shoreham could have been relegated on the same evening but place-above Molesey’s league encounter with South Park was postponed owing to a waterlogged pitch. That means it’s not all over in terms of survival for Mussels, though, it looks to be a matter of time before that happens. Even Shoreham manager Donnelly, who saw his team concede from three set-pieces in the defeat to Guernsey, has given up hope. Harry Tobin netted from two corners in the first half, before Ryan-Zico Black’s free-kick wrapped up all three points for Guernsey just five minutes after the restart. There was some confusion where the game would take place on the morning of the fixture. Guernsey tweeted that the match had been switched to Haringey Borough’s North London home but Shoreham’s groundstaff managed to get Middle Road playable. And Donnelly did not use the uncertainty surrounding where the game would take place as an excuse. Donnelly’s focus is now on next season, with two squad members already agreeing on stays. Young full-back Alfie Proto-Gates will remain at Middle Road, as will goalkeeper James Broadbent. 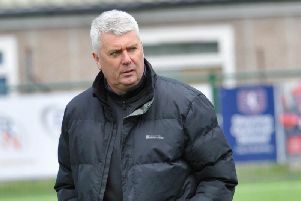 With Shoreham boss Donnelly hoping more follow suit as the season draws to a close. “This season has been a real learning curve for everyone,” Donnelly said. “It’ll be a young, fresh-looking squad next season but hopefully we’ll all be better for what we’ve experienced over a tough campaign. Mussels must win at Hastings United on Saturday to stand any chance of survival. n Mussels were edged out by Herne Bay in a Bostik League South meeting at Middle Road on Saturday. Jake Embery got the only goal as his side ran out 1-0 victors. Shoreham boss Sammy Donnelly was able to name the same team in successive games for the first time this season. Mussels’ manager believes that pinpoints one of the reasons behind his side’s struggles this season.